Yes, I’m still here. Sorry for the lack of updates recently; this new year has been really busy for me so far. Not only have I been swamped with work, but this is also the time of year when the Southern California Linux Expo (SCaLE) occurs. I’ve been a part of the A/V staff for the past few years, and these past two months have been extremely busy with preparations for the event. Needless to say, this hasn’t left me with a whole lot of free time for various things such as anime (although I have managed to sneak in a few episodes here and there) and various other hobbies and past times, such as my other favorite, playing Japanese role-playing games (JRPGs.) But I found a pretty fun and cute little app that has helped keep me entertained and put a smile on my face. Dreeps (available on the iOS App Store) claims itself as the world’s first “Alarm Playing Game,” and bills itself as the perfect fit for those of us who don’t have the time to play JRPGs any more. You “control” a little robot boy as he explores mysterious lands, fights fearsome enemies, meets fellow travelers and other NPC’s, and gathers treasure and experience points. Every night, you set an alarm, and both you and your character go to sleep, regenerating lost hit points. When the alarm rings, both you (hopefully) and your character wake up and begin a new day of exploration and adventure. 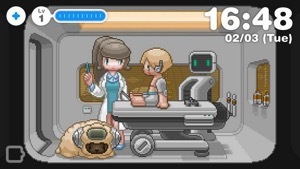 You can check into the game periodically throughout the day, tamagotchi-style, and see how your character is doing, or if he needs to be revived, etc. The 8-bit graphics and chip tune soundtrack are both gorgeous and charming and are very reminiscemt of many classic JRPGs such as Final Fantasy, Chrono Trigger and the like. Now, calling this a “game” is a bit of a stretch, because there isn’t really a whole lot of interaction involved. You set the alarm every night, and also, if your character gets KO’d in battle, the game will notify you and give you a chance to revive him. Still, this is still a really cute and fun app; it’s fun to check in throughout the day periodically to see what cool new area he’s exploring, or what enemies he’s fighting. Still, it might be nice if there were a little bit of interactivity added into the game; for example, getting prompted with decision points every once in a while (“Should I go to the abandoned city, or the crystal forest?”) or some tiny interactions with NPCs or something; but not too much, as the “mostly sit back and see what happens” hands-off approach is a good fit for this title. Dreeps is available for $2.99 (c’mon folks, that’s less than the cost of one morning coffee) on the iOS App Store and is compatible with all iOS devices (iPhone, iPod touch and iPad.) Read more about it and check out screenshots at the Dreeps website and watch their trailer video on YouTube or via the player embedded below the cut.